The Milky Way as seen from Death Valley, 2007. This is a panoramic picture. The Milky Way (a translation of the Latin Via Lactea, in turn derived from the Greek Γαλαξίας (Galaxias) sometimes referred to simply as "the Galaxy"), is a barred spiral galaxy that is part of the Local Group of galaxies. Although the Milky Way is one of billions of galaxies in the observable universe, the Galaxy has special significance to humanity as it is the home galaxy of the planet Earth. The Milky Way galaxy is visible from Earth as a band of light in the night sky, and it is the appearance of this band of light which has inspired the name for our galaxy. Some sources hold that, strictly speaking, the term Milky Way should refer exclusively to the observation of the band of light, while the full name Milky Way Galaxy, or alternatively the Galaxy should be used to describe our galaxy as an astrophysical whole. It is unclear how widespread the usage of this convention is, however, and the term "Milky Way" is routinely used in either context. This dazzling infrared image from NASA's Spitzer Space Telescope shows hundreds of thousands of stars crowded into the swirling core of our spiral Milky Way galaxy. In visible-light pictures, this region cannot be seen at all because dust lying between Earth and the galactic center blocks our view." Visible from Earth as a hazy band of white light that is seen in the night sky, arching across the entire celestial sphere, the visual phenomenon of the Milky Way (as seen in the night sky) originates from stars and other material which lies within the galactic plane. The Milky Way looks brightest in the direction of the constellation of Sagittarius, toward the galactic center. Relative to the celestial equator, it passes as far north as the constellation of Cassiopeia and as far south as the constellation of Crux, indicating the high inclination of Earth's equatorial plane and the plane of the ecliptic relative to the galactic plane. The fact that the Milky Way divides the night sky into two roughly equal hemispheres indicates that our Solar System lies close to the galactic plane. The Milky Way has a relatively low surface brightness, making it difficult to see from any urban or suburban location suffering from light pollution. The stellar disk of the Milky Way galaxy is approximately 100,000 light years in diameter, and is believed to be, on average, about 1,000 light years thick. It is estimated to contain at least 200 billion stars and possibly up to 400 billion stars, the exact figure depending on the number of very low-mass stars, which is highly uncertain. Extending beyond the stellar disk is a much thicker disk of gas. Recent observations indicate that the gaseous disk of the Milky Way has a thickness of around 12,000 light years - twice the previously accepted value. As a guide to the relative physical scale of the Milky Way, if it were reduced to 130 km (80 mi) in diameter, the Solar System would be a mere 2 mm (0.08 inches) in width. The Galactic Halo extends outward, but is limited in size by the orbits of the two Milky Way satellites, the Large and the Small Magellanic Clouds, whose perigalacticon is at ~180,000 light-years. It is extremely difficult to define the age at which the Milky Way formed, but the age of the oldest star in the Galaxy yet discovered is estimated to be about 13.2 billion years, nearly as old as the Universe itself. This estimate is based on research done in 2004 by astronomers Luca Pasquini, Piercarlo Bonifacio, Sofia Randich, Daniele Galli, and Raffaele G. Gratton. The team used the UV-Visual Echelle Spectrograph of the Very Large Telescope to measure, for the first time, the beryllium content of two stars in globular cluster NGC 6397. This allowed them to deduce the elapsed time between the rise of the first generation of stars in the entire Galaxy and the first generation of stars in the cluster, at 200 million to 300 million years. By including the estimated age of the stars in the globular cluster (13.4 ± 0.8 billion years), they estimated the age of the oldest stars in the Milky Way at 13.6 ± 0.8 billion years. (See also nucleocosmochronology.) Based upon this emerging science, the Galactic thin disk is estimated to have been formed between 6.5 and 10.1 billion years ago. Observations by the Spitzer Space Telescope in 2005 backed up previously collected evidence that suggested the Milky Way is a barred spiral galaxy. It consists of a bar-shaped core region surrounded by a disk of gas, dust and stars. Within the disk region are several arm structures that spiral outward in a logarithmic spiral shape. The mass distribution within the Galaxy closely resembles the Sbc Hubble classification, which is a spiral galaxy with relatively loosely-wound arms. It was only in the 1980s that astronomers began to suspect that the Milky Way is a barred spiral rather than an ordinary spiral, which observations in 2005 with the Spitzer Space Telescope have since confirmed, showing that the Galaxy's central bar is larger than previously suspected. This argues for a classification of type SBbc (loosely wound barred spiral). In 1970 Gérard de Vaucouleurs predicted that the Milky Way was of type SAB(rs)bc, where the "rs" indicates a broken ring structure around the core region. As of 2006, the Milky Way's mass is thought to be about 5.8 × 1011 M☉ comprising 200 to 400 billion stars. Its integrated absolute visual magnitude has been estimated to be −20.9. Most of the mass of the Galaxy is thought to be dark matter, forming a dark matter halo of an estimated 600–3000 billion solar masses (M☉) which is spread out relatively evenly. The galactic disc, which bulges outward at the galactic center, has a diameter of between 70,000 and 100,000 light-years. The distance from the Sun to the galactic center is now estimated at 26,000 ± 1400 light-years, while older estimates could put the Sun as far as 35,000 light-years from the central bulge. The galactic center harbors a compact object of very large mass (named Sagittarius A*), strongly suspected to be a supermassive black hole. Most galaxies are believed to have a supermassive black hole at their center. The Galaxy's bar is thought to be about 27,000 light-years long, running through its center at a 44 ± 10 degree angle to the line between the Sun and the center of the Galaxy. It is composed primarily of red stars, believed to be ancient (see red dwarf, red giant). The bar is surrounded by a ring called the "5-kpc ring" that contains a large fraction of the molecular hydrogen present in the Galaxy, as well as most of the Milky Way's star formation activity. Viewed from the Andromeda Galaxy, it would be the brightest feature of our own galaxy. Outside of the major spiral arms is the Outer Ring or Monoceros Ring, a ring of stars around the Milky Way proposed by astronomers Brian Yanny and Heidi Jo Newberg, which consists of gas and stars torn from other galaxies billions of years ago. As is typical for many galaxies, the distribution of mass in the Milky Way Galaxy is such that the orbital speed of most stars in the Galaxy does not depend strongly on its distance from the center. Away from the central bulge or outer rim, the typical stellar velocity is between 210 and 240 km/s. Hence the orbital period of the typical star is directly proportional only to the length of the path traveled. This is unlike in the Solar System where different orbits are also expected to have significantly different velocities associated with them, and is one of the major pieces of evidence for the existence of dark matter. Another interesting aspect is the so-called "wind-up problem" of the spiral arms. If one believes that the inner parts of the arms rotate faster than the outer part, then the Galaxy will wind up so much that the spiral structure will be thinned out. But this is not what is observed in spiral galaxies; instead, astronomers propose that the spiral arms form as a result of a matter-density wave emanating from the galactic center. This can be likened to a moving traffic jam on a highway — the cars are all moving, but there is always a region of slow-moving cars. Thus this results in several spiral arms where there are a lot of stars and gas. This model also agrees with enhanced star formation in or near spiral arms; the compressional waves increase the density of molecular Hydrogen and protostars form as a result. The galactic disk is surrounded by a spheroid halo of old stars and globular clusters, of which 90% lie within 100,000 light-years, suggesting a stellar halo diameter of 200,000 light-years. However, a few globular clusters have been found farther, such as PAL 4 and AM1 at more than 200,000 light-years away from the galactic center. While the disk contains gas and dust obscuring the view in some wavelengths, the spheroid component does not. Active star formation takes place in the disk (especially in the spiral arms, which represent areas of high density), but not in the halo. Open clusters also occur primarily in the disk. 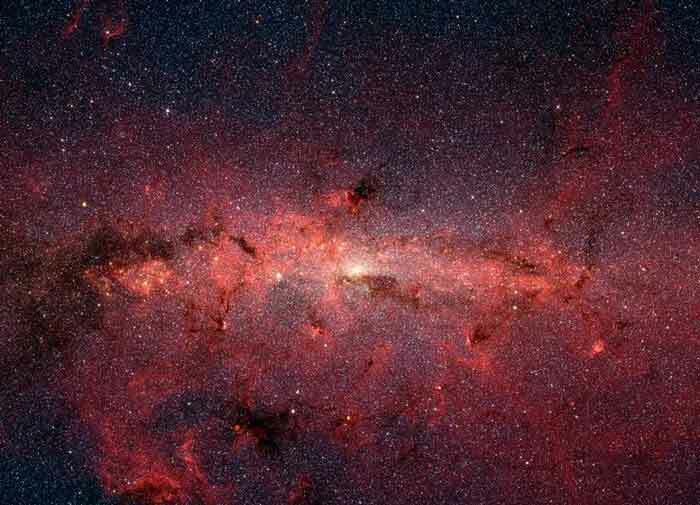 Recent discoveries have added dimension to the knowledge of the Milky Way's structure. With the discovery that the disc of the Andromeda Galaxy (M31) extends much further than previously thought, the possibility of the disk of the Galaxy extending further is apparent, and this is supported by evidence of the newly discovered Outer Arm extension of the Cygnus Arm. With the discovery of the Sagittarius Dwarf Elliptical Galaxy came the discovery of a ribbon of galactic debris as the polar orbit of Sagittarius and its interaction with the Milky Way tears it apart. Similarly, with the discovery of the Canis Major Dwarf Galaxy, it was found that a ring of galactic debris from its interaction with the Milky Way encircles the galactic disk. On January 9, 2006, Mario Juric and others of Princeton University announced that the Sloan Digital Sky Survey of the northern sky found a huge and diffuse structure (spread out across an area around 5,000 times the size of a full moon) within the Milky Way that does not seem to fit within current models. The collection of stars rises close to perpendicular to the plane of the spiral arms of the Galaxy. The proposed likely interpretation is that a dwarf galaxy is merging with the Milky Way. This galaxy is tentatively named the Virgo Stellar Stream and is found in the direction of Virgo about 30,000 light-years away. The Sun (and therefore the Earth and Solar System) may be found close to the inner rim of the Galaxy's Orion Arm, in the Local Fluff or the Gould Belt, at a hypothesized distance of 7.62±0.32 kpc from the Galactic Center. The distance between the local arm and the next arm out, the Perseus Arm, is about 6,500 light-years. The Sun, and thus the Solar System, is found in what scientists call the galactic habitable zone. The Apex of the Sun's Way, or the solar apex, is the direction that the Sun travels through space in the Milky Way. The general direction of the Sun's galactic motion is towards the star Vega near the constellation of Hercules, at an angle of roughly 60 sky degrees to the direction of the Galactic Center. The Sun's orbit around the Galaxy is expected to be roughly elliptical with the addition of perturbations due to the galactic spiral arms and non-uniform mass distributions. In addition the Sun oscillates up and down relative to the galactic plane approximately 2.7 times per orbit. This is very similar to how a simple harmonic oscillator works with no drag force (dampening) term. It takes the Solar System about 225–250 million years to complete one orbit of the galaxy (a galactic year), so it is thought to have completed 20–25 orbits during the lifetime of the Sun and 1/1250th of a revolution since the origin of humans. The orbital speed of the Solar System about the center of the Galaxy is approximately 220 km/s. At this speed, it takes around 1400 years for the Solar System to travel a distance of 1 light-year, or 8 days to travel 1 AU. The Milky Way and the Andromeda Galaxy are a binary system of giant spiral galaxies. Together with their companion galaxies they form the Local Group, a group of some 50 closely bound galaxies. The Local Group is part of the Virgo Supercluster. The Milky Way is orbited by two smaller galaxies and a number of dwarf galaxies in the Local Group. The largest of these is the Large Magellanic Cloud with a diameter of 20,000 light-years. It has a close companion, the Small Magellanic Cloud. The Magellanic Stream is a peculiar streamer of neutral hydrogen gas connecting these two small galaxies. The stream is thought to have been dragged from the Magellanic Clouds in tidal interactions with the Galaxy. Some of the dwarf galaxies orbiting the Milky Way are Canis Major Dwarf (the closest), Sagittarius Dwarf Elliptical Galaxy, Ursa Minor Dwarf, Sculptor Dwarf, Sextans Dwarf, Fornax Dwarf, and Leo I Dwarf. The smallest Milky Way dwarf galaxies are only 500 light-years in diameter. These include Carina Dwarf, Draco Dwarf, and Leo II Dwarf. There may still be undetected dwarf galaxies, which are dynamically bound to the Milky Way. Observations through the zone of avoidance are frequently detecting new distant and nearby galaxies. Some galaxies consisting mostly of gas and dust may also have evaded detection so far. In January 2006, researchers reported that the heretofore unexplained warp in the disk of the Milky Way has now been mapped and found to be a ripple or vibration set up by the Large and Small Magellanic Clouds as they circle the Galaxy, causing vibrations at certain frequencies when they pass through its edges. Previously, these two galaxies, at around 2% of the mass of the Milky Way, were considered too small to influence the Milky Way. However, by taking into account dark matter, the movement of these two galaxies creates a wake that influences the larger Milky Way. Taking dark matter into account results in an approximately twentyfold increase in mass for the Galaxy. This calculation is according to a computer model made by Martin Weinberg of the University of Massachusetts, Amherst. In this model, the dark matter is spreading out from the galactic disc with the known gas layer. As a result, the model predicts that the gravitational effect of the Magellanic Clouds is amplified as they pass through the Galaxy. Current measurements suggest the Andromeda Galaxy is approaching us at 100 to 140 kilometers per second. The Milky Way may collide with it in 3 to 4 billion years, depending on the importance of unknown lateral components to the galaxies' relative motion. If they collide, it is thought that the Sun and the other stars in the Milky Way will probably not collide with the stars of the Andromeda Galaxy, but that the two galaxies will merge to form a single elliptical galaxy over the course of about a billion years. Many astronomers believe the Milky Way is moving at approximately 600 km per second relative to the observed locations of other nearby galaxies. Most recent estimates range from 130 km/s to 1,000 km/s. If the Galaxy is moving at 600 km/s, Earth travels 51.84 million km per day, or more than 18.9 billion km per year, about 4.5 times its closest distance from Pluto. The Galaxy is thought to be moving towards the constellation Hydra, and may someday become a close-knit member of the Virgo cluster of galaxies. Another reference frame is provided by the Cosmic microwave background (CMB). The Milky Way is moving at around 552 km/s with respect to the photons of the CMB. This can be observed by satellites such as COBE and WMAP as a dipole contribution to the CMB, as photons in equilibrium at the CMB frame get blue-shifted in the direction of the motion and red-shifted in the opposite direction. There are many creation myths around the world which explain the origin of the Milky Way and give it its name. The English phrase is a translation from Greek Γαλαξίας, Galaxias, which is derived from the word for milk (γάλα, gala). This is also the origin of the word galaxy. In Greek myth, the Milky Way was caused by milk spilt by Hera when suckled by Heracles. The term Milky Way first appeared in English literature in a poem by Chaucer. —Geoffrey Chaucer, Geoffrey Chaucer The House of Fame, c. 1380. In a large area from Central Asia to Africa, the name for the Milky Way is related to the word for straw. It has been claimed that this was spread by Arabs who in turn borrowed the word from Armenian. In several Uralic, Turkic languages, Fenno-Ugric languages and in the Baltic languages the Milky Way is called the "Birds' Path". The Chinese name "Silver River" (銀河) is used throughout East Asia, including Korea. In Japanese, "Silver River" (銀河 ginga) means galaxies in general and the Milky Way is called the "Silver River System" (銀河系 gingakei) or the "River of Heaven" (天の川 ama no kawa). In Swedish, it is called Vintergatan, or "Winter Street", because the stars in the belt were used to predict time of the approaching winter. 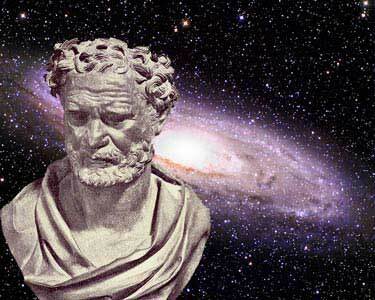 The Greek philosopher Democritus (450–370 BC) was the first known person to propose that the Milky Way might consist of distant stars. Actual proof of this came in 1610 when Galileo Galilei used a telescope to study the Milky Way and discovered that it was composed of a huge number of faint stars. In a treatise in 1755, Immanuel Kant, drawing on earlier work by Thomas Wright, speculated (correctly) that the Milky Way might be a rotating body of a huge number of stars, held together by gravitational forces akin to the Solar System but on much larger scales. The resulting disk of stars would be seen as a band on the sky from our perspective inside the disk. Kant also conjectured that some of the nebulae visible in the night sky might be separate "galaxies" themselves, similar to our own. The first attempt to describe the shape of the Milky Way and the position of the Sun within it was carried out by William Herschel in 1785 by carefully counting the number of stars in different regions of the sky. He produced a diagram of the shape of the Galaxy with the Solar System close to the center. In 1917, Heber Curtis had observed the nova S Andromedae within the "Great Andromeda Nebula" (Messier object M31). Searching the photographic record, he found 11 more novae. Curtis noticed that these novae were, on average, 10 magnitudes fainter than those that occurred within our galaxy. As a result he was able to come up with a distance estimate of 150,000 parsecs. He became a proponent of the "island universes" hypothesis, which held that the spiral nebulae were actually independent galaxies. In 1920 the Great Debate took place between Harlow Shapley and Heber Curtis, concerning the nature of the Milky Way, spiral nebulae, and the dimensions of the universe. To support his claim that the Great Andromeda Nebula was an external galaxy, Curtis noted the appearance of dark lanes resembling the dust clouds in the Milky Way, as well as the significant Doppler shift. The matter was conclusively settled by Edwin Hubble in the early 1920s using a new telescope. He was able to resolve the outer parts of some spiral nebulae as collections of individual stars and identified some Cepheid variables, thus allowing him to estimate the distance to the nebulae: they were far too distant to be part of the Milky Way. In 1936 Hubble produced a classification system for galaxies that is used to this day, the Hubble sequence. 1. ^ The Milky Way is twice the size we thought it was. University of Sydney News. University of Sydney (2008-02-20). Retrieved on 2008-02-20. 5. ^ Freedman, Roger A.; Kaufmann, William J. (2007). Universe. WH Freeman & Co., p. 605. ISBN 0-7167-8584-6. 6. ^ "Galaxies — Milky Way Galaxy". Encyclopedia Britannica 19. (1998). Encyclopedia Britannica, Inc.. p. 618. 7. ^ Pasachoff, Jay M. (1994). Astronomy: From the Earth to the Universe. Harcourt School, p. 500. ISBN 0-03-001667-3. 8. ^ Christian, Eric. How large is the Milky Way?. Retrieved on 2007-11-28. 9. ^ Sanders, Robert. "Milky Way galaxy is warped and vibrating like a drum", UCBerkeley News, January 9, 2006.Retrieved on 2006-05-24. 10. ^ Frommert, H.; Kronberg, C. (August 25, 2005). The Milky Way Galaxy. SEDS. Retrieved on 2007-05-09. 12. ^ Connors, et al.. "N-body simulations of the Magellanic stream", Monthly Notices of the Royal Astronomical Society, January 26, 2007. Retrieved on 2007-01-26. 14. ^ Ortwin, Gerhard (2002). "Mass distribution in our Galaxy". Space Science Reviews 100 (1/4): 129–138. Retrieved on 2007-03-14. 15. ^ Chen, W.; Gehrels, N.; Diehl, R.; Hartmann, D. (1996). "On the spiral arm interpretation of COMPTEL ^26^Al map features". Space Science Reviews 120: 315–316. Retrieved on 2007-03-14. 16. ^ McKee, Maggie. "Bar at Milky Way's heart revealed", New Scientist, August 16, 2005. Retrieved on 2007-05-09. 17. ^ López-Corredoira, M.; Cabrera-Lavers, A.; Mahoney, T. J.; Hammersley, P. L.; Garzón, F.; González-Fernández, C. (2007). "The Long Bar in the Milky Way: Corroboration of an Old Hypothesis". The Astronomical Journal 133 (1): 154–161. Retrieved on 2007-03-15. 18. ^ Karachentsev, I. D.; Kashibadze, O. G. (2006). "Masses of the local group and of the M81 group estimated from distortions in the local velocity field". Astrophysics 49 (1): 3–18. 19. ^ Vayntrub, Alina (2000). Mass of the Milky Way. The Physics Factbook. Retrieved on 2007-05-09. 20. ^ a b Battaglia, G.; Helmi, A.; Morrison, H.; Harding, P.; Olszewski, E. W.; Mateo, M.; Freeman, K. C.; Norris, J.; Shectman, S. A. (2005). "The radial velocity dispersion profile of the Galactic halo: Constraining the density profile of the dark halo of the Milky Way". Monthly Notices of the Royal Astronomical Society 364: 433–442. Retrieved on 2007-05-09. 21. ^ Grant. J.; Lin, B.. "The Stars of the Milky Way", Fairfax Public Access Corporation. Retrieved on 2007-05-09. 22. ^ Blandford, R.D. (1999). "Origin and evolution of massive black holes in galactic nuclei". Galaxy Dynamics, proceedings of a conference held at Rutgers University, 8–12 Aug 1998,ASP Conference Series vol. 182. 23. ^ Staff (September 12, 2005). Introduction: Galactic Ring Survey. Boston University. Retrieved on 2007-05-10. 24. ^ Imamura, Jim (August 10, 2006). Mass of the Milky Way Galaxy. University of Oregon. Retrieved on 2007-05-10. 25. ^ Harris, William E. (February 2003). Catalog of Parameters for Milky Way Globular Clusters: The Database (text). SEDS. Retrieved on 2007-05-10. 26. ^ Ibata, R.; Chapman, S.; Ferguson, A. M. N.; Lewis, G.; Irwin, M.; Tanvir, N. (2005). "On the accretion origin of a vast extended stellar disk around the Andromeda galaxy". Astrophysical Journal 634 (1): 287–313. Retrieved on 2007-05-10. 27. ^ Outer Disk Ring?. SolStation. Retrieved on 2007-05-10. 28. ^ Reid, Mark J. (1993). "The distance to the center of the Galaxy". Annual review of astronomy and astrophysics 31: 345–372. Retrieved on 2007-05-10. 29. ^ Eisenhauer, F.; Schödel, R.; Genzel, R.; Ott, T.; Tecza, M.; Abuter, R.; Eckart, A.; Alexander, T. (2003). "A Geometric Determination of the Distance to the Galactic Center". The Astrophysical Journal 597: L121–L124. Retrieved on 2007-05-10. 30. ^ Horrobin, M.; Eisenhauer, F.; Tecza, M.; Thatte, N.; Genzel, R.; Abuter, R.; Iserlohe, C.; Schreiber, J.; Schegerer, A.; Lutz, D.; Ott, T.; Schödel, R. (2004). "First results from SPIFFI. I: The Galactic Center" (PDF). Astronomische Nachrichten 325: 120–123. Retrieved on 2007-05-10. 31. ^ Eisenhauer, F. et al. (2005). "SINFONI in the Galactic Center: Young Stars and Infrared Flares in the Central Light-Month". The Astrophysical Journal 628 (1): 246–259. Retrieved on 2007-08-12. 32. ^ English, Jayanne. "Exposing the Stuff Between the Stars", Hubble News Desk, 1991-07-24. Retrieved on 2007-05-10. 33. ^ Leong, Stacy (2002). Period of the Sun's Orbit around the Galaxy (Cosmic Year). The Physics Factbook. Retrieved on 2007-05-10. 34. ^ Garlick, Mark Antony (2002). The Story of the Solar System. Cambridge University, 46. ISBN 0521803365. 35. ^ University of California, Berkeley (2006-01-09). "Milky Way galaxy is warped and vibrating like a drum". Press release. Retrieved on 2007-10-18. 36. ^ Wong, Janet. "Astrophysicist maps out our own galaxy's end", University of Toronto, April 14, 2000. Retrieved on 2007-01-11. 37. ^ Kogut, A.; Lineweaver, C.; Smoot, G. F.; Bennett, C. L.; Banday, A.; Boggess, N. W.; Cheng, E. S.; de Amici, G.; Fixsen, D. J.; Hinshaw, G.; Jackson, P. D.; Janssen, M.; Keegstra, P.; Loewenstein, K.; Lubin, P.; Mather, J. C.; Tenorio, L.; Weiss, R.; Wilkinson, D. T.; Wright, E. L. (1993). "Dipole Anisotropy in the COBE Differential Microwave Radiometers First-Year Sky Maps". Astrophysical Journal 419: 1. Retrieved on 2007-05-10. 38. ^ Online Etymology Dictionary. Retrieved on 2007-01-03. 39. ^ Harutyunyan, Hayk (2003-08-29). "The Armenian name of the Milky Way". ArAS News 6. Armenian Astronomical Society (ArAS). Retrieved on 2007-01-05. 40. ^ J. J. O'Connor, E. F. Robertson (November 2002). Galileo Galilei. University of St Andrews. Retrieved on 2007-01-08. 41. ^ Evans, J. C. (November 24, 1998). Our Galaxy. George Mason University. Retrieved on 2007-01-04. 42. ^ Abbey, Lenny. The Earl of Rosse and the Leviathan of Parsontown. The Compleat Amateur Astronomer. Retrieved on 2007-01-04. 43. ^ Heber D. Curtis (1988). "Novae in Spiral Nebulae and the Island Universe Theory". Publications of the Astronomical Society of the Pacific 100: 6. 44. ^ Weaver, Harold F.. Robert Julius Trumpler. National Academy of Sciences. Retrieved on 2007-01-05. 45. ^ E. P. Hubble (1929). "A spiral nebula as a stellar system, Messier 31". Astrophysical JournalEngl 69: 103–158. 46. ^ Sandage, Allan (1989). "Edwin Hubble, 1889–1953". The Journal of the Royal Astronomical Society of Canada 83 (6). Retrieved on 2007-01-08. The Milky Way at the Astro-Photography Site Of Mister T. Yoshida. A new view of the Milky Way galaxy obtained by the Diffuse Infrared Background Experiment (DIRBE) on NASA's Cosmic Background Explorer satellite (COBE).